Is it profitable to move away from coal in Poland? Zielna Conference Centre, Zielna 37 Str. IBS seminar about costs and benefits of potential decarbonisation of Polish power sector - Warsaw, 28th of November. Before the UN climate summit, we discussed the consequences of choosing one of two transformation pathways for the Polish energy sector: decarbonisation (a significant reduction in CO2 emissions) or its lack. During the first part of the seminar, we showed which scenario would be more expensive in terms of operating and investment costs. We also analysed the impact of both scenarios on CO2 emissions, GDP and unemployment. During the second part, we juxtaposed two potentially key technologies for possible decarbonisation: nuclear energy and offshore wind farms. The final element of the seminar was a panel discussion with representatives of public institutions, NGOs and academia. The starting point for the discussion were the results of the IBS research described in the report ‘Risks associated with the decarbonisation of the Polish power system’. 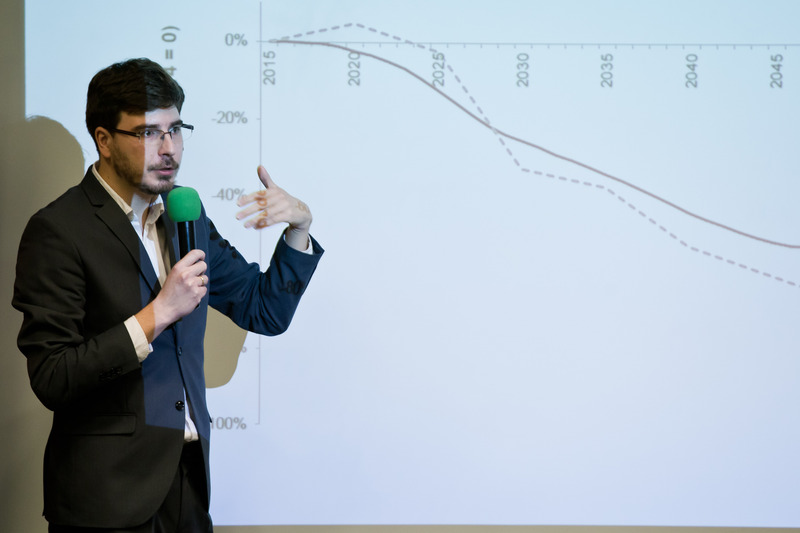 At the beginning of the seminar, Marek Antosiewicz (IBS, Warsaw School of Economics) presented the optimal (cheapest) electricity mixes for Poland. He showed that the percentage of coal would start to decrease even in the baseline pathway (no decarbonisation). However, this would happen relatively late and on a small scale. Decarbonisation would force faster changes and greater differentiation in the electricity mix. In 2050, the electricity mix is expected to consist of 27% from nuclear energy, 20% from onshore wind farms and in 13% from gas. Biogas and biomass, with a marginal role in the baseline scenario, are expected to account for 13% and 6%, respectively. The remaining 20% is expected to come from coal and other technologies. According to simulations carried out at IBS, there are no significant differences between decarbonisation and no decarbonisation in terms of the impact on GDP, unemployment and other macroeconomic factors. Next, Jan Witajewski-Baltvilks (IBS, University of Warsaw) extended the economic analysis by including the risks of the decarbonisation and the baseline (no decarbonisation) scenarios. He showed that decarbonisation would not necessarily entail mass layoffs in mining. The problem of reduced stability of energy supplies can be solved, for example, by relatively flexible production of energy from gas. 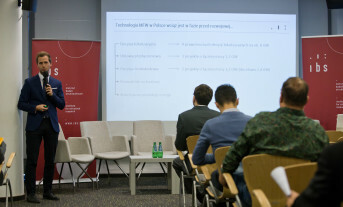 In the context of the development of technology related to renewable energy sources, Witajewski-Baltvilks demonstrated that, although transformation could mean greater dependence on the part of the Polish economy on foreign technology providers, Polish industry has the potential to effectively respond to this challenge. Analysing the risks associated with the no-decarbonisation scenario, he indicated that Poland would have less energy security and a weaker international position. Long-term maintenance of the current energy system will require increased efficiency of coal extraction and production and, thus, greater investment costs. There is a clear decarbonisation trend throughout the world; therefore, the technologies developed in Poland will be of little use globally. During the second part of the seminar, we juxtaposed nuclear energy and offshore wind energy. 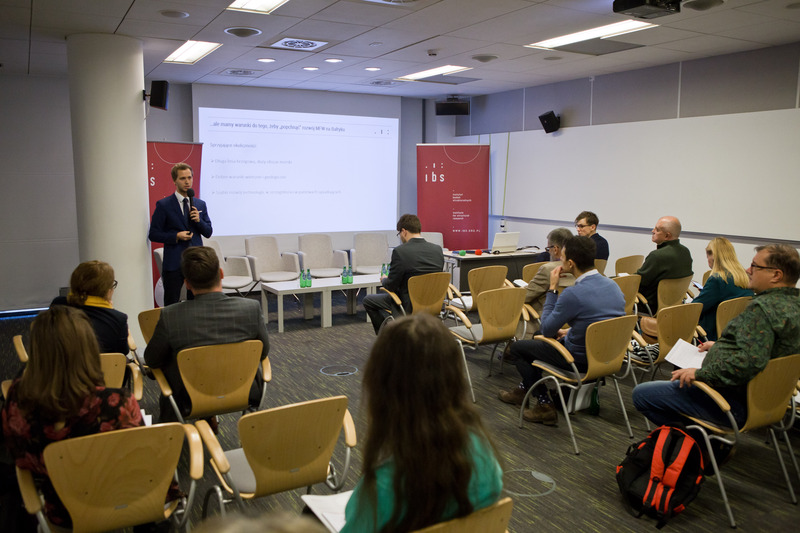 Jakub Sawulski (IBS, Warsaw School of Economics) presented the challenges related to the implementation of the offshore wind energy system in Poland. Poland’s geographical location makes it a key factor in terms of greater exploration of the Baltic Sea by offshore wind farms. Sawulski presented a number of challenges for implementation of this technology, e.g., unpredictable public policy, limited transmission infrastructure, low quality of scientific research and poor knowledge transfer between the business and science sectors ( → see IBS Working Paper). Jerzy Lipka, from the Civil Movement for Nuclear Energy, presented the issue of nuclear energy, including issues such as the amount of fuel consumed in a year, energy efficiency, differences between reactors, as well as a short history of the construction of the power plant in Żarnowiec. During the last part of the seminar, we discussed the advantages and disadvantages of different transformation pathways. The participants of the panel discussion included: Robert Jeszke (National Centre for Emissions Management), Jerzy Lipka (Civil Movement for Nuclear Energy), Joanna Maćkowiak-Pandera (Energy Forum), Łukasz Sawicki (Ministry of Energy, Nuclear Energy Department) and Jan Witajewski-Baltvilks (Institute for Structural Research, University of Warsaw). The discussion was moderated by Daniel Kiewra (IBS). ‘Coal is slowly retiring’, said Joanna Maćkowiak-Pandera (Energy Forum). She stated that the use of our own raw materials is important, but using exclusively our own resources is a luxury. The key to the profitability of coal-fired power plants are the prices of CO2 emission trading allowances, the EU ETS. Robert Jeszke (National Centre for Emissions Management) discussed how prices are determined. According to some analysts, EU ETS prices will increase before falling over several years after 2020, but price projections are not definite. Jan Witajewski-Baltvilks (IBS, University of Warsaw) compared the optimal energy mix presented by the Ministry of Energy in ‘Poland's Energy Policy until 2040’ with IBS research. He said that the optimal energy mixes proposed by IBS have room for both nuclear and wind energy (off- and onshore). Łukasz Sawicki (Ministry of Energy) gave an overview of the current stage of potential construction work on one nuclear power plant. The investor, PGE J1, is conducting research in two potential locations: Lubiatowo and Żarnowiec. In the context of possible public opposition to the construction of a nuclear power plant, Jerzy Lipka (Civil Movement for Nuclear Energy) pointed out that there is also social resistance directed at lignite open pit mines and onshore wind farms. Thank you for your participation and valuable comments! 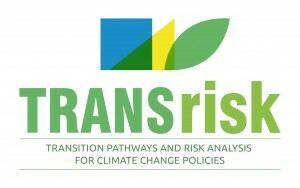 The seminar summarises the Polish part of TRANSrisk project.